Finally... Finally, the temperature is starting to go down. Monday is supposed to be 10 degrees cooler than today. And by then, we'll have more night than day. The season of scaring will be here. And Fantasy Flight is ready to celebrate with their Arkham Nights event. It's all things horror and Lovecraft. At least, the minions of Nephren-Ka are evil, and they're looking to bring the long-dead pharaoh back to life. You investigators will have to make sure that doesn't happen. It's what you're tasked with doing in Omens of the Pharaoh, which is the new expansion for Elder Sign, available now. Knowledge is power. That's been known for quite some time (and thus, has been powerful for quite some time). Knowledge of one's enemy in a conflict can certainly make the going easier. And when the enemy is an ageless deity looking to destroy the Earth, yeah, you might want to know what you're going up against. Finding that knowledge is a key part of the upcoming Omens of the Pharaoh expansion for Elder Sign. Look at how that'll work in this new preview from Fantasy Flight. Once again, the true evil in the world rears its ugly head. 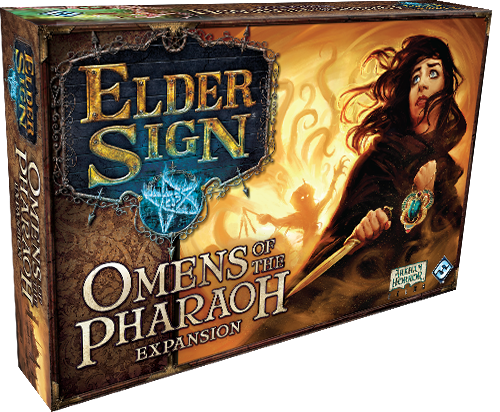 That's where you'll be headed (well, Egypt, anyway, not necessarily the "ancient" part) in Omens of the Pharaoh, a new expansion coming for Elder Sign. It would seem that the Great Old Ones liked sunshine and cats, too. When out in the middle of the ocean, you might think that coming across an island would be a good thing. Heck, you might even be out there looking for clues to a mystery, clues that might be on that island. But you might not want to celebrate when the lookout shouts, "Land ho!" Instead, you should be cautious and wary. Will the expedition to the island reveal the information you're looking for? Will everyone make it back with their life and sanity intact? In Omens of the Deep, the new expansion for Elder Sign, that's not always a guaranteed thing. I have to admit something: I never want to go out into the ocean. There's just too many things out there in it that I don't know anything about and it kinda creeps me out. Simply not for me. 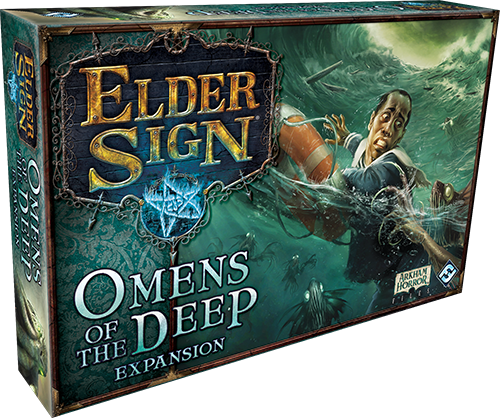 That sort of fear of the water can be brought right to my tabletop, if I so fee, with Omens of the Deep, the upcoming expansion for Elder Signs, of which Fantasy Flight has posted a preview. Those that know about H.P. Lovecraft's work know about the mythical city of R'lyeth. Heck, even those with only a passing knowledge of Lovecraft's books might recognize the name of the city sunken in the Pacific ocean that's devoted to Cthulhu. Well, soon you'll be able to search for the city, yourself, along with your fellow investigators in Omens of the Deep, a new expansion coming for Elder Sign. Though I may be in Atlanta, it certainly doesn't feel like the "sunny South" right now. Yes, I know it's much, much colder in my old stomping grounds in, say, Chicago, but it's not like it's beach weather here, either. Nobody's way down yonder on the Chattahoochee learning to swim right now (or at least, I seriously doubt they are). It feels much more like the great, white North, which is where Omens of Ice, the upcoming expansion for Elder Sign, takes you. 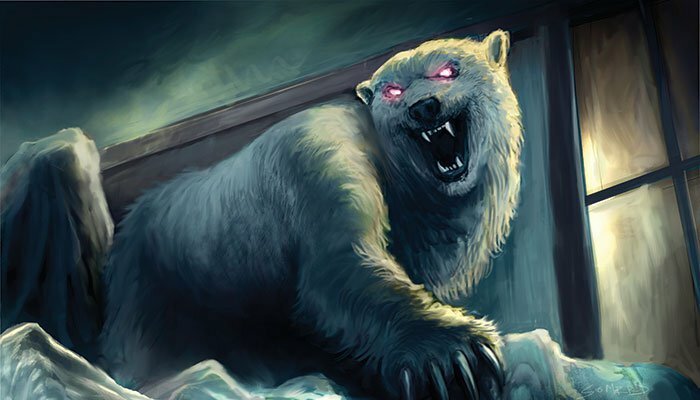 Today, Fantasy Flight Games is giving us a look inside this icy expansion. A muffled cry goes unanswered in the darkest exhibit halls of the Arkham Museum. Strange, otherworldly relics lie under glass on display tables or sit in storage crates. Too long, the Museum has collected rare artifacts from across the globe… drawing them together under one roof… creating a nexus of eldritch power… Fantasy Flight Games is thrilled to announce that Elder Sign, the horrifying game of dice and dementia, is now on sale at your local retailer and on our webstore! Fantasy Flight Games have posted PDF rules for Elder Sign, Gears of War and Dust Tactics. Fantasy Flight Games have posted a new preview of the Elder Signs card game looking at some of the Elder Gods that gamers will encounter. Fantasy Flight Games have posted the first preview of the upcoming Elder Sign boardgame. Fantasy Flight Games proudly announces the upcoming release of Elder Sign! This fast-paced, cooperative dice game by Richard Launius and Kevin Wilson, the designers of Arkham Horror, is loaded with supernatural intrigue for one to eight players. Elder Sign lets players control investigators who must successfully endure Adventures within the museum in order to gather clues, items, and the eldritch knowledge they need to seal the rifts between dimensions. A clever and thematic dice mechanic pits their exploration against monsters and the sheer difficulty of staying sane and healthy while investigating the most dangerous exhibits and most terrifying instances of insanity.